In general I would be the first person to tell you that “it’s not about the fly”, and mostly to be quite honest it isn’t. Presentation always comes first, always, but there are times when matching the hatch becomes more or less important, even on relatively infertile freestone streams. I fished only days ago on a local water which is just settling down from the spate conditions of winter, a month into the fishing season and still cold and moderately high but definitely “fishable”. Up in the mountains it was still quite cloudy and there was a nip to the South Easterly wind which was blowing upstream, hard enough to make good presentations a little problematic but not sufficiently so to make accurate casting impossible. The first run didn’t produce any response from the fish and there were no discernible rises, but there was lots and lots of insect activity. Thousands of net-winged midges huddled out of the breeze on the sides of the rocks and formed rafts of bodies along the margins where the hapless insects , unfortunate enough to end up in the drink, had spun off the main currents. There were micro caddis flies in both black and tan hues running about on the streamside boulders and it all looked promising, just no rises. The next pocket saw the first fish come to the net, nothing spectacular, although I was pleased to be able to effectively “high stick” a drag free drift at the top of the little waterfall that defined the back of the pocket. It isn’t always easy to get right and this time it worked perfectly, the upstream breeze helping to be sure and the fish taking just as the artificial came over the lip.. The next run and another fish, both taken on a fairly large and nondescript spider pattern, things were looking up and despite the conditions and lack of rises it seemed that the fish were feeding happily. Then there was a long period of nothing, good drifts, at least as far as I could tell, and no action. I lengthened the leader and considered adding a subsurface pattern but to be honest I didn’t really wish to do that. This was an R & R day not a work day and I really wanted to catch fish on the dry, plus with all these bugs around the fish would have to come on at some point surely. I missed a half-hearted take in a shallow run under the bankside vegetation, I really got the impression that perhaps the fish didn’t fully commit to the fly, it would be considered quite a large pattern and I was using it primarily to aid visibility in the high and slightly choppy water. Plus as the fish weren’t coming up I was hoping to appeal to their sense of greed and “drum up” some interest. Things carried on like this, I kept on expecting the fish to start moving and once the sun broke through and the early morning mountain clouds burned off I was even more hopeful. I lured one more fish out of the corner of a deep run, he wasn’t big but was inordinately fat, the fish in general seemed to have been doing well over the winter months and were in fine fettle. Then searching through shallow pockets I saw a fish head and tail, it was the first activity other than that elicited by my own imitations, and it looked to be a half decent fish too. I carefully changed position and put out a reasonable cast, no response from the fish, perhaps the fly landed just short? Another presentation and the fly landed perfectly, I prepared myself for the take but nothing happened and I rather feared that I had put down, what was to this point my only feeding fish. Then I decided to change flies, with all these caddis about surely that would be a better option than the spider. I tied a small parachute caddis pattern onto the fine tippet, trouble was that it really is a rather tiny size 20 and in the windy and choppy conditions not easy to see on the water. Not the sort of fly for use during general prospecting in such conditions. Fortunately the fly landed where intended just above where I had seen the rise, and managed to keep track of the tiny white post sufficiently well to see the gentle sip of the fish as the fly was inhaled. I set the hook after a short pause and the fish took off like a rocket. Then the battle really got going, in the high water amongst the rocks the fish went berserk, jumping completely out of the water several times, trying to duck behind and under the boulders and using the strong current to its advantage. The fragile 7X tippet however held and I eventually got the trout into the net. I must digress for a moment and say that I have become seriously impressed with this Stroft™ tippet material, it has rarely if ever let me down, even the fine stuff I prefer to fish. A gorgeous 17 inch rainbow, fit as a flea, and in perfect condition. A few quick photographs and I released it to fight another day. From then on the fishing was a struggle, the wind worsened, the wading became tiresome and as the swirling breeze grew stronger tangles in the long leader became more frequent. In the end I packed up and headed back to the car, I had only intended to fish for the morning anyway. It hadn’t been the best of days, and things hadn’t really lived up to the early morning promise, but I was most satisfied to have fooled a few trout and in particular one which had eschewed one pattern in favour of another more imitative fly. 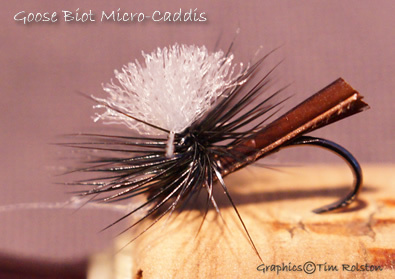 The goose biot micro caddis pattern that I was using was designed years back, specifically to cover the early season emergence of these tiny black caddisflies. The conditions weren’t ideal for fishing such a small and delicate fly but the proof of the pudding, as they say, is in the eating. There is always something satisfying about catching a fish that has refused previously, all the more so if one succeeds with a fly of one’s own manufacture, never mind design. Those caddis should hang around on the river for quite a few days yet, it tends to be a long lasting event and hopefully I shall be able to trick a few more fish with the same fly before the water drops and the caddis die off.